True to the form of minimalism, Richard Chartier's music is singular in focus and expansive in execution. What seems at first to be sparse and simple reveals itself to be an exposition of sound or as Will Montgomery once put it, "the bareness of the works is illusory" and "pulsating aural life becomes apparent." 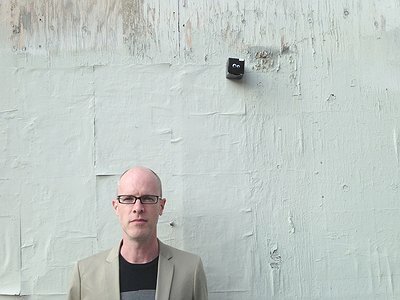 Prolific both as a solo artist, occasionally under the moniker of Pinkcourtesyphone and as a collaborator, Chartier has had work released by labels all over the world and has been involved in projects with visual artists and other musicians including Taylor Deupree, Nosei Sakata and more recently William Basinski. Founder and curator of recording label LINE, Chartier champions the work of international sound artists and composers such as Bernhard Gunter, Steve Roden, Asmus Tietchens and Mark Fell. Straying from the limitations of musicality allows Chartier to explore more fully and freely the intersection of sound, space, perception and silence. I don’t consider what I do music. I am not musically trained. Musical theories don’t really come into play when I am creating sound pieces. I started really working abstractly with sound in 1990. Before that I was trying to create more song-based, structured music. Early influences in the 1980s that shifted my perception of sound, how it could be used, manipulated, and presented include Zoviet France, The Hafler Trio, John Duncan, Throbbing Gristle and later Pansonic (at that time Panasonic). Mika + Ilpo’s first releases got me interested in working with sound again after stopping, roughly between 1993-1997. What are currently your main compositional- and production-challenges? Creating something that engages me to refine and push it further. What do you usually start with when working on a new piece? Usually one sound will spark the beginning and direction of the whole piece. Of course, by the end that may all change. Every time is different as every moment is different. How strictly do you separate improvising and composing? I am not very improvisational in the performative sense. I don’t consider what I do to be improvising. But at the beginning of working on a piece... starting from nothing is always improvisation you could say. Sometimes accident can be an unintended improv. My most recent collaboration with my friend William Basinski, “Aurora Liminalis” actually did begin as a loose improv sitting around in his studio. Every beginning in life is in some way by chance. How do you see the relationship between sound, space and composition? I see what I do as constructing a space or an aural field in endless combinations and possibilities. Those three words are inseparable in my process. Do you feel it important that an audience is able to deduct the processes and ideas behind a work purely on the basis of the music? If so, how do you make them transparent? In my opinion, or at least with my work, I do not feel the audience should be thinking... just experiencing. I am not interested in creating an academic experience. The experience should be transparent in that you don’t need to know anything to enjoy or be absorbed by it. In how much, do you feel, are creative decisions shaped by cultural differences – and in how much, vice versa, is the perception of sound influenced by cultural differences? Perception of sound is very influenced by culture and a listener's environment - but creativity is universal. Every beginning in life is in some way by chance.